Larry Graham, Jr. (born August 14, 1946 in Beaumont, Texas) is an American baritone singer, musician, songwriter, and record producer. He is best known as both the bass guitar player in the popular and influential psychedelic soul/funk band Sly & the Family Stone, and as the founder and frontman of Graham Central Station. He is credited with the invention of the slapping technique, which radically expanded the tonal palette of the bass guitar, although he himself refers to the technique as Thumpin' and Pluckin'. Graham played bass in the highly successful and influential funk band Sly & the Family Stone from 1967 to 1972. He developed slap bass to provide percussive and rhythmic elements in addition to the notes of the bassline when the band lacked a drummer. 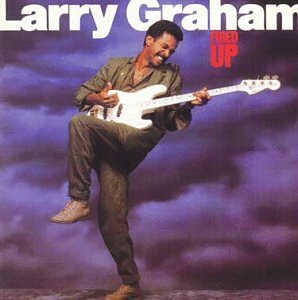 Larry Graham pioneered the art of slap-pop playing on the electric bass guitar, which has become archetypical of modern funk. Slap-pop playing couples a percussive thumb-slapping technique of the lower strings with an aggressive finger-snap of the higher strings, often in rhythmic alternation. The slap and pop technique incorporates a large ratio of muted (or 'ghost' tones) to normal notes, to add to the rhythmic effect. This "machine-gun bass" style was later used by Les Claypool, Bootsy Collins, Louis Johnson (bassist), Mark King (musician), Flea, Victor Wooten, Marcus Miller, Stanley Clarke, John Norwood Fisher, P-Nut, Danny McCormack, Dirk Lance). Upon the Family Stone's disintegration due to lead singer Sly Stone's drug addiction, Graham formed his own band, Graham Central Station. The name is a pun of "Grand Central Station", a famous train station located in the Manhattan borough of New York City. Graham Central Station had several hits in the 1970s, including "Hair." In the mid 1970s, Larry Graham worked with Betty Davis, the wife of jazz legend Miles Davis. Betty Davis' band included members of the Tower of Power horns and the Pointer Sisters, and she recorded three albums to critical acclaim but limited commercial success. In 1975, Graham became a member of the Jehovah's Witnesses. In the early 1980s, Graham recorded five solo albums and had several solo hits. His biggest hit was "One in a Million, You", which reached number 9 on the Billboard chart in 1980. He recorded another album in the late 1990s, with a new band using the Graham Central Station name. Two of the new members were former Family Stone bandmates Cynthia Robinson and Jerry Martini. He also toured with Prince and his band as his bassist in 2000. Paul McCartney would have made more people pick up a Bass to "be a musician" but I reckon Mr Graham to be the most influential "playing Bass wise", if you can understand what I mean. Interestingly , Prince fans hate him , almost to a man over the religious influence. I find this laughable as there is so many Prince tracks I hear buckets of Sly Stone and Larry Graham on. I'd reccomend staying clear of his solo (late'70s - early '80's output) and go with getting as much Graham Central Station and Sly and the Family Stone as you can lay your hands on. Pure Bass goodness, and it's not about "SLAPPING" it's about playing FUNK. One of the few slap bassists i like.